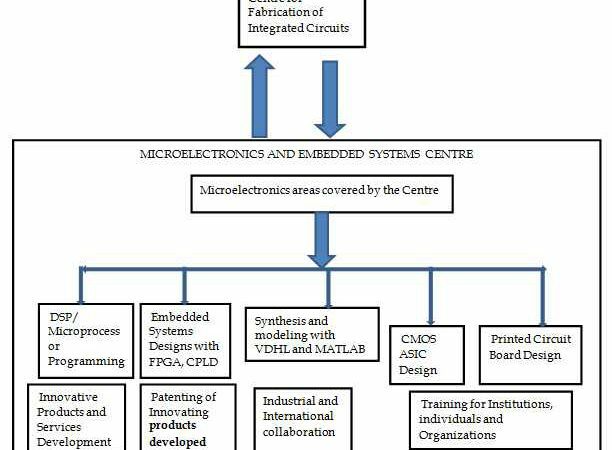 This paper presents development and diffusion of microelectronics and embedded systems technologies in Nigeria as key factors towards achieving Nigeria’s Vision20:2020. The Vision20:2020 objectives and necessary steps that have been identified as vital to its achievement are briefly discussed. Investments in technology driven Agriculture and Hi-tech manufacturing industries to boost the Nation’s gross domestic product (GDP) and gross national income (GNI) stand out among the vital steps identified. Researchers have observed that appropriate diffusion of microelectronics and embedded systems technologies enhance economic activities and help to transition developing economies from consuming to creating. They drive medicine, energy, agriculture, production, entertainment and indeed all key industrial areas of the 21century. Nigeria must therefore focus on developing and diffusing these technologies as a new and necessary growth engine needed to produce an accelerated economic growth towards achieving vision 20:2020. A road map to facilitate development and diffusion of these technologies in Nigeria (hence positioning Nigeria to take the lead in Africa) was clearly articulated. With appropriate Government policies, support from all stake holders and the will to stick to the implementation plans, in place, sustenance of achieved development and economic growth will be guaranteed and vision20:2020 will be achieved. Keywords: Microelectronics, Embedded systems, Vision20:2020, Technology, Development, Nigeria, Road map. Nigeria often referred to as the Giant of Africa has not been able to show dominance in many of the metrics (GDP, GNI, Standard of living of her citizens, etc) used in comparing nations. (NairaBrain, 2009; USAID, 2010; NigeriaWorld, 2010; Segun, 2010; Nigeria-Planet, 2011). Nigeria has continued to lag behind among the committee of nations despite her abundant natural and human resources due to the inability of her government and people to identify and summon the will to invest massively in key areas that will make the most impact on her economy. The prevalence of corruption coupled with the lack of adequate commitment and dedication as well as unwillingness of Nigerians to make sacrifices has made things worse. Several governments in Nigeria have come up with different policies and plans aimed at achieving certain set goals which were clearly defined (NPC, 2011; NigerianWiki, 2008; Ogugua, 1994; Ikeanyibe, 2009; NigeriaWorld, 2010). These policies and plans have not yielded the expected results due to weak implementation and lack of political will to see the development strategy through to the end (NPC, 2011). This is evident considering the development and efficiency level of public infrastructures and systems in Nigeria. These have resulted in poverty, hunger, fallen standards in education and living, etc. These issues must be tackled from selected front lines where the most efficient result will be obtained. At the end of the 2008 Nigeria Economic Summit, a vision termed NIGERIA VISION 20:2020 was identified to put the nation among the top 20 economies in the world by the year 2020 (SciCon, 2011, NPC, 2011). Progressive achievement of this vision is the focus of all development programmes embarked upon by the nation’s governments and people, since then. Key areas identified as front-liners in achieving the vision must be vigorously pursued so as to avoid a repetition of history where the goals and objectives of the vision will not be realized by the end of the projected period. It has been generally agreed by many stakeholders that investing in developing the Nation’s technological education is a major key to achieving economic growth and development (Rukmani, 2008; Mokyr, 1992; Allafrica, 2009; Onyenekenwa, 2011; Accessmylibrary, 2008). Countries that must lead other countries in economy, GDP, GNI, developed infrastructures, etc, must first lead in the development and the sustenance of their technology. The two broad objectives are to make efficient use of human and natural resources to achieve rapid economic growth as well as to translate the economic growth into equitable social development for all citizens. The development aspirations cut across four dimensions: Social (building a peaceful, equitable, harmonious and just society), Economic (developing a globally competitive economy), Institutional (having a stable and functional democracy) and Environmental (achieving a sustainable management of the nation’s natural resources). Nigeria needs to urgently address the most serious constraints to her growth and competitiveness, aggressively pursue a structural transformation of the economy from a mono-product to a diversified and industrialized economy and invest in human capital to transform Nigerians into active agents for growth and national development. Manufacturing and services are expected to dominate the structure of national output, while gross national investment is expected to increase, and the infrastructure base of production is expected to improve considerably. Income per capita should have risen to $US4,000 from the estimate of US$1,230 in the year 2008 (NPC, 2011). The growth strategy requires divestment from dependence on oil as an engine of growth, transformation of the structure of exports from primary to processed/manufactured goods and the attainment of high levels of efficiency in production. Thus, NV20:2020 will effectively link industrial activities with the primary sector, domestic with foreign trade, and the services sub-sector to all other productive activities. How Possible is Achieving the Vision? Nigeria must grow at least 9.5% annually within the next eleven years, 2011 included. It was ranked 44th ($174b, 2009) and chasing Belgium which was 20th ($471b, 2009), according to International Monetary Fund (IMF) (Admin, 2011). Making that jump will require a compounded interest of 298% by 2020 which will translate to 171% percentage growth in the GDP. This analysis assumes that the GDP of the 20th economy will remain constant in 2020. For a nation that has averaged about 5.5% in growth, in the last seven years, it does mean that it needs a new growth engine. We believe that developing our microelectronics and embedded systems technologies will provide us with this new growth engine because they will provide indigenous technological solutions to our indigenous problems. They enable you to design, develop and manufacture innovative components, products and services at reduced cost while maximizing functionality. What are Microelectronics and Embedded Systems? Microelectronics describes a group of technologies that integrate multiple devices into a small physical area. Several components are available in microelectronic scale such as transistors, capacitors, resistors, diodes, insulators and conductors. Microelectronics can be divided to its subfields namely: micro electromechanical systems (MEMS), nanoelectronics, optoelectronics and single electron devices (SED). Integrated circuits and microchips are typical microelectronic devices, which can be found in computers, mobile phones, medical devices, process control equipments, technology based agricultural and manufacturing tools and equipments, automobiles, etc. Embedded systems are small, fast, and very powerful tools, gadgets and equipments which have become part of our everyday life. An embedded system is a micro-processor based system that is built to control a function or range of functions (Heath, 2003). They form a part of a larger system or product, part of anything: mobile phones, medical devices, agricultural farming tools and equipment, manufacturing equipment, etc. They are a combination of hardware and software, and perhaps additional mechanical or other parts, designed to perform a dedicated function (Netrino, 2011). Although the user can make choices concerning the functionality, he cannot change the functionality of the system by adding or replacing software as is possible with the PC. An embedded system is designed to perform one or a few dedicated and/or specific functions but with choices and different options (Michael, 2007; Heath 2003). Microelectronics and Embedded Systems technologies play major roles in our modern day history because they continue to shape global commerce and industry. They drive medicine, energy, agriculture, entertainment and all key industrial areas of the 21century. Researchers have observed that appropriate diffusion of nanotechnology, microelectronics and embedded systems technologies enhances economic activities and helps to transition developing economies from consuming to creating (Ekekwe, 2010; Brishti, 2000; Norman, 1980, Electronics Weekly, 2009). Today, more microprocessors around the globe are being manufactured using microelectronics technologies. A large percentage of these microprocessors are used in embedded systems rather than in PCs. Those already large numbers are increasing at a phenomenal rate as the devices that surround us become smarter and smaller. This is a consequence of our insatiable drive towards having control over devices and access to data anywhere, anytime. General-purpose computers, like PCs, would be far too costly for the majority of products that incorporate some form of embedded system technology (Christoffer, 2006). Also, general-purpose solutions might also fail to meet a number of functional or performance requirements such as constraints in power-consumption, size-limitations, reliability or real-time performance, etc. We cannot conduct our normal modern daily lives, today, without this technology. We all own at least one piece of equipment, which contains a microprocessor, whether it is a phone, a television, an automatic washing machine or an MP3 player. All sectors of the economy have been influenced by the digital revolution and the industry has experienced tremendous developments in all aspects of engineering disciplines (Bruce, 2011). As Nations drive to become global leaders in technology creation, massive diffusion of microelectronics and embedded systems technologies must necessarily be the anchor for that development. Several initiatives (MOSIS (USA), CMC Microsystems (Canada), Europractice (Europe) and TSMC (Taiwan) (The MOSIS Service, 2010; CMC Microsystems, 2012; Europractice, 2012; TSMC, 2012) have been used by some developed and developing economies, all programs supported by their respective governments towards practical oriented training and learning on microelectronics. Over the years, these initiatives and several others (Savage, 1997; Reynolds, 2007) have enabled the different nations to train and develop more relevant practically oriented professionals for the Industries. ICT is rapidly moving Nigeria towards knowledge-based economic structures and information societies. This remarkable success of ICT in Nigeria and indeed globally since the dawn of the 20th century has been enabled by the phenomenal growth of the microelectronics and embedded systems technologies all over the world. Microelectronics is the engine that drives the information age and without its constant evolution, ICT cannot advance (Courtney, 2011). Unfortunately, the microelectronics industry does not have presence in Nigeria despite a hugely expanding ICT sector. Over the years, many Nigerian Institutions have developed and taught courses on microelectronics. However, lack of institutional capabilities, like excellent facilities, teaching and learning environments have stalled its capacity to offer practical and relevant skills needed by its students and industry to facilitate the diffusion of microelectronics technology from bottom-up approach in the nation. At present, to the best of the author’s knowledge, no Sub-Sahara African University or Institution has a world-class microelectronics and embedded systems teaching and training environment. There is the challenge of the lack of adequate funding which has partly affected the abilities to have the right mix of people, processes and tools. This has affected Africa’s capacity to develop world-class programs on microelectronics and embedded systems. This is a challenge we must tackle and overcome if we must advance in this age where technology drives development. The European, American and Asian Governments and Industries take investment in research, innovation and development as vital tools to achieving national development (Kostas, 2006; BMBF, 2009; Bisht and Rakesh, 2001; Microsoft, 1999; Peter, 2006; David, 2009; Mosk, 2004; TCS, 2007). We cannot ignore the importance of investing in developing and diffusing key technologies like microelectronics and embedded systems which create a platform for others to thrive and hope to enjoy the impact they have on national development. Road Map to Position Nigeria to Lead in Microelectronics and Embedded Systems Technologies in Africa. Due to our unflinching belief that developing and diffusing microelectronics and embedded systems technologies in Nigeria will provide us with the new growth engine needed to accelerate and drive development in Nigeria towards achieving Vision20:2020, we have developed a road map to position Nigeria to lead in microelectronics and embedded systems technologies here presented in three phases: Acquisition of necessary personnel, equipment and infrastructure, Human capacity building and lastly, Innovative products and services development through collaboration between established Research Institutes and Centres on microelectronics and embedded systems technologies and the industry. Acquisition of Necessary Personnel, Equipment and Infrastructure. The necessary equipment and Infrastructure has to be acquired first to provide a suitable environment for human capacity building. We propose the setting up of microelectronics and embedded systems research and training Centres in each State of the federation through collaboration between the Federal and State Government as well as relevant Industries. They will be equipped with necessary personnel, facilities, equipment and software for research and training in microelectronics and embedded systems technologies. They will serve as research and training Centres for both Industries and Educational Institutions (Primary, Secondary and Tertiary Institutions) in the area where they are located. Primary Educational Institutions are included to introduce the pupils early to relevant superficial but fundamental knowledge of these technologies. The Centres will also have International collaborations with other microelectronics and embedded systems training centres in developed countries of the world. One foundry laboratory for the production of integrated circuits should be established by the Federal Government in collaboration with relevant Industries to provide foundry services (fabrication of ICs and PCB) for the research and training Centres established all over the country and other countries in Africa. 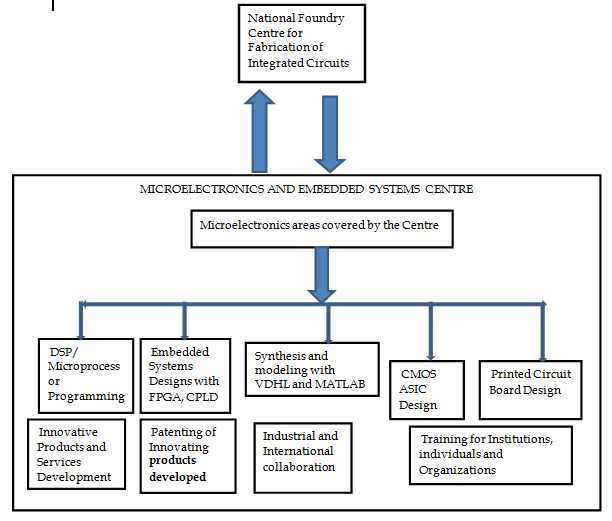 Fig1 shows the proposed microelectronics and embedded systems center and the necessary collaborations. This phase which covers the training section involves all the required training needed to develop a deep core knowledge base in microelectronics and embedded systems technologies in Nigeria. Introductory courses in Microelectronics and Embedded Systems Technologies, FPGA synthesis design, Microprocessor programming, digital signal processing, Advanced Analogue Integrated Circuits, CAD Design of Digital Very Large Scale Integrated (VLSI) systems and Printed Circuit Boards (PCB), etc will be taught and the necessary practical applications will be carried out. Professionals employed at the Centres will be directly in charge of the organized training. Some companies that offer professional training services can also be contracted to participate in the training for a determined time interval. Collaborating Educational Institutions and other Public and Private Research Institutes and Organizations can also train their Faculty and staff at the centre at their costs. The training will be hands on (practical biased) blended with the theoretical training so as to ensure technical transfer of the technologies. Participants who show outstanding performances after their training will be retained at the Centre to develop innovative products and services. These products and services will be patented and transformed to finished market goods through collaborations with relevant Industries. Collaboration with the Academia will also be facilitated to ensure that innovative research products developed in these Universities are further developed in the Centre and transformed to finished market products through Industrial collaborations. Development of several innovative products and services which will contribute to the Nations GDP and GNI after being transformed to finished market goods through Industrial collaborations. Patenting of new products and services developed. Human capacity building of those directly or indirectly involved with the project. Emergence of technology clusters and hubs in Nigeria. Stimulation of Industrial growth in Nigeria through establishment of new firms (SMEs) based on microelectronics and embedded systems technologies and marketing of their products and services. Publications on developed innovative products and services. A base to attract local and foreign grants for projects in the country. Industrial and International collaborations in microelectronics and embedded systems technologies. Employment opportunities for Nigerians and others who will participate directly or indirectly in the project. The developed economies of the world know the significance of utilizing scientific and technological knowledge in industrial production, and have explicitly put in place institutions and mechanisms for their exploitation. The successes of these countries show the need to focus on ways to exploit scientific and technological knowledge for national development rather than rely solely on resource endowment. This explains the advancement of some natural resources poor countries like Germany that have transformed imported raw materials into high value products and services through the application of science and technology. Nigeria has lots of advantages such as abundant human capital, natural resource endowment, good climatic conditions, etc. By summoning the will to have and implement policies to develop our indigenous microelectronics and embedded systems technologies, we will see unprecedented growth in our economy because microelectronics and embedded systems form the bedrock of most technologies found today. Most of the tools and equipment used in industrial and manufacturing processes depend on one form of microelectronics and embedded systems technology or another. Engaging in human capacity building through establishment and funding of research and training centers on microelectronics and embedded systems technologies will provide the platform for indigenous solutions in the form of equipment, machines, tools, products, etc ranging from very simple to complex systems to be developed. The growing needs of our agricultural, manufacturing and other industrial sectors will be met as other technologies will thrive on this platform. This will provide the new growth engine that will enable us achieve Vision 20:2020. Bruce, M. (2011). Why Study for an Embedded Systems Degree?. Science and Engineering UK. Retrieved at http://www.science-engineering.net/embedded-systems.htm Cambridge University Press. Christoffer, A. (2006). Embedded systems technology in ABB. ABB Review. 2. pp14-17. Electronics Weekly. (2009). Rebuild the economy on Electronics. Electronic Weekly, 10/14/2009, Issue 2402, p7-7. Heath, S. (2003). Embedded systems design. EDN series for design engineers (2 ed.). Newnes. p. 2. ISBN9780750655460. Ikeanyibe, O., M. (2009). Development Planning in Nigeria: Reflections on the National Economic Empowerment and Development Strategy (NEEDS) 2003-2007. J Soc Sci, 20(3): 197-210. Kostas, G. ( 2006). The Challenge of Embedded Systems ABB Review. 2, pp 6-8. Michael, B. (2007). Embedded Systems Glossary. Netrino Technical Library. Retrieved 30/06/11 at http://www.netrino.com/node/21. Onyenekenwa, C., E. (2011). Nigeria’s Vision20:2020-Issues, Challenges, and Implications for Development Management. Asian Journal of Rural Development1 (1):21-40. Peter, T. (2006). Embedded systems technologies ABB Review, 2, pp3. (2007). Tata Consultancy Services Bets on Embedded Systems to Spur Growth in Japan. Tata Consultancy Services Ltd (TCS).